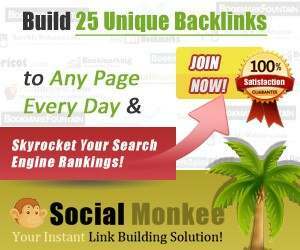 It's very cheap and lifetime service that can generate thousands of backlinks during your membership. You need to uprade your membership to actually see huge results in ranking. For that price is no brain to don't join at all. Your 7 dollars you will get very easily and quickly back. Social bookmarks are still very efective after newest Google updates, maybe this is the reason why Socialmonkee is more and more popular. Even I joined Socialmonkee about half year ago, because 7 dollars for lifetime membership is offer that you can’t refuse at all. So I decided to make honest Socialmonkee review, where I will share all my feelings about Socialmonkee, but you want to know how it works and what you can get for 7 dollars. Well if you join Socialmonkee, you can every day submit your url 25 social bookmarks websites, in other words this system will generate 25 backlinks every day to your website (of course you can upgrade your membership to be able submit more than 1 url to more than 25 social bookmarks websites – but I will speak about this later in this socialmonkee review). So let’s look deeply into this Socialmonkee review ..
Well, if you login there is form where you will submit your url (you have to fill description, title, tags and description. Great for every online marketer is fact that there is spinners integration. So you can easily spin your description, tags and title – with this feature you will avoid Google penalty because of duplicate content. Also if you are too lazy like me to login every day to Socialmonkee dashboard, there are a lot of possibilities that can make it even more easier. You can easily install for free Socialmonkee Firefox or Google Chrome plugin and all what you have to do will be to go to your url that you want to submit and use this browser addon. It’s push button solution how to get a little boost every day. Also as I said earlier in this Socialmonkee review, for 7 dollars you will get lifetime membership without any additional fees. But as I said you can anytime upgrade your membership to get even more backlinks every day. It’s also important to say that your backlinks will be automatically indexing, because Socialmonkee has web based integration with other indexing services like indexification. Together with spinners like WordAI, it’s really killer among similiar services. 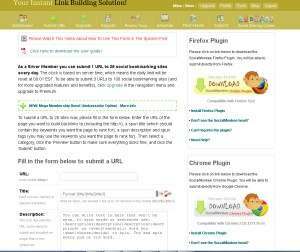 You will get unique backlinks that will be almost instantly indexed. Basically with standart membership you are allowed to recieve 25 backlinks per day and only from social bookmarks sites, but if you upgrade your Socialmonkee account, you will also recieve backlinks from social networks and also you will recieve more backlinks to your urls. In other words if you upgrade membership, you will recieve more backlinks that are more valuable. But honestly if you purchase only 7 dollar membership, you will recieve 750 backlinks per month – forever. It’s up to you if you will use these backlinks to your money site (and yes they are safe and sometimes with high pagerank), or to your blog network or some members are selling these social bookmarks on sites like Fiverr. It’s up to you how you will use these links, but my opinion is that it’s really great deal that you can’t refuse without trying. Yes, there is 60 days money back guarantee, so you can try socialmonkee and then you can easily decide if you want to continue (there are no recurring payments). Let’s speak honestly – for 7 dollars you will get what you pay for, but I think that 750 backlinks per month forever for 7 dollars is really awesome deal (if I have to compare with other social bookmarks services). Well I wanted to make this Socialmonkee review honest, so I am saying that you have to join Socialmonkee if you want almost free backlinks pointing to your site. And in these times every safe backlink counts. If you have any questions, you can leave your comment below this Socialmonkee review and I will try to help you as fast as possible or you can also contact me anytime you want. Well I hope that you found this Socialmonkee review useful and helpful.